This pic goes into the category of things you just know are wrong....but where is code violated? What you see is a duplex receptacle mounted in a 3-0 box. It is attached where the box cover usually attaches. There are covers made for this box that hold a single receptacle, but not a duplex. An oversize receptacle coverplate will just about cover the front of the box. I just took a duplex just like that out of service today and it had a Raco Dup cover made of stamped steel. 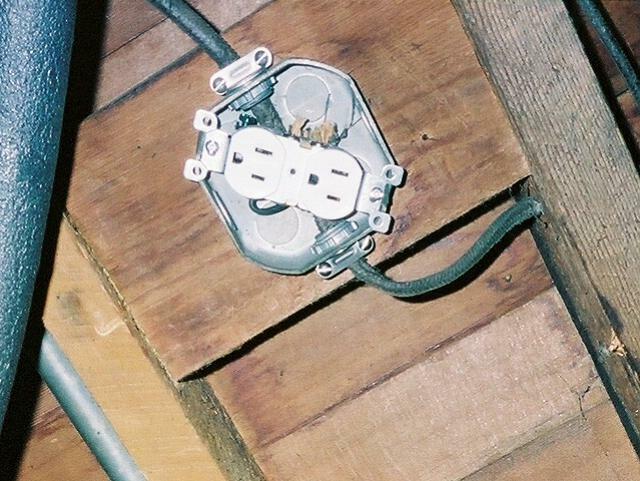 [*] Is this Outlet Grounded (Box and Receptacle) - via an EGC? [*] Is there adequate free Conductor length in this Box? I've never seen the duplex cover for the smaller (3-0) box...didn't know there was one. Maybe this is OK after all? Sierra- sharp eye! 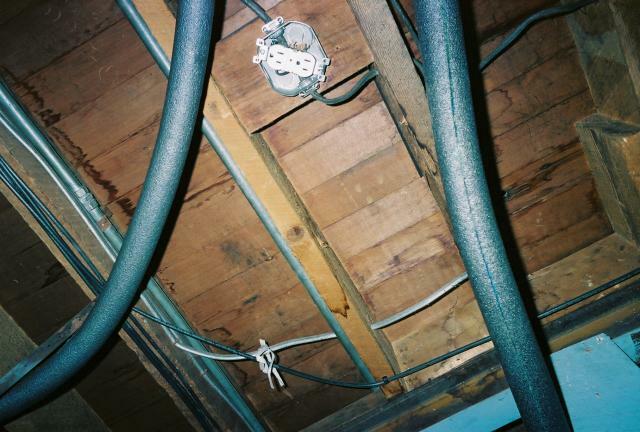 You are correct, the old romex has no ground wire. As for "free conductor" length, that I'm not so sure about; back then there was no such requirement. Conductors often had insulation skinned off them as they passed through the box, and a very short pigtail twisted and soldered in place, then wrapped with tape. Box should be a device box so that the device can be properly installed. I am aware of that cover, and I am commenting on this "incorrect" installation. The receptacle on the round cover is secured to the octagon box using the two 8/32 screws that are used to secure the entire assembly. The installation here is not correct under any circumstances! I've seen many of these that have the mounting ears/yoke cut off right at the recptacle. 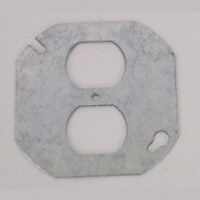 The receptacle is held to the cover with the single 6-32 in the center of the cover, while the cover itself is screwed to the box with the usual 8-32s. Here is that cover --- and the proper receptacle is made without a yoke (strap) and the single 6/32 screw is actually a violation since this would be a "cover mounted" receptacle.